Fort Nisqually was an important fur trading and farming post of the Hudson's Bay Company in the Puget Sound area, part of the Hudson's Bay Company's Columbia Department. It was located in what is now DuPont, Washington. Today it is a living history museum located in Tacoma, Washington, USA, within the boundaries of Point Defiance Park. 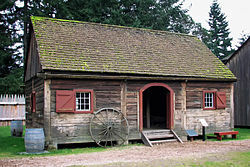 The Fort Nisqually Granary, moved along with the Factor's House from the original site of the second fort to this park, is a U.S. National Historic Landmark. Built in 1843, the granary is the oldest building in Washington state and one of the only surviving examples of a Hudson's Bay Company "post on sill" structure. The Factor's House and the granary are the only surviving Hudson's Bay Company buildings in the United States. The Hudson's Bay Company expanded to the west coast by forming the Columbia District to oversee its operations in what was known by American interests as the Oregon Country. Forts would be built in the District at central fur gathering locations, accessible to a large number of tribes. In 1824, Fort Vancouver was built a few miles from the Columbia River to the south and Fort Langley was built in 1827 on the Fraser River to the North. The Cowlitz Portage, an overland and shortcut route was soon created, and thus a vital link between the two forts was established. After the attack and murder of Alexander McKenzie and four men in his party on this route, it was determined a fort located at a halfway point was needed for safety and security reasons. The new midway location was at Nisqually, chosen for its excellent ship anchorage, its convenience for overland travel, the friendliness of local tribes and its prairies for grazing animals and growing crops. Located near the mouth of Sequalitchew Creek on the plains north of the Nisqually River Delta, in the present town of DuPont, Washington, Nisqually House was built in April 1832. The staff was only three men with a few supplies left behind to manage it. The first building of station was a storehouse of fifteen by twenty feet built on the beach, notably the first European trading post on the Puget Sound. One year later in May 1833, Chief Trader Archibald McDonald returned with William Fraser Tolmie and seven men to begin the construction of a permanent fort. Tolmie spent the year there and wrote about the region extensively. The men were dependent upon the surrounding native villages for sustenance because they were unable to find much game to hunt. Relations with neighboring Indigenous people began to deepen, the officers of the post meeting with Chief Gray Head of the Steilacooms in 1833. Trading with the nearby Puyallup tribe and more distant S'Klallams developed in the same year. Fort Nisqually was operated and served by Scottish gentlemen, Native Americans, Hawaiian Kanakas, French-Canadians, Métis, West Indians, Englishmen and, in later years a handful of Americans. Fort Nisqually grew from an obscure trading post to major international trading establishment, despite not being a true military outpost. The fort's main export was beaver pelts that could be used for making a beaver-pelt top hat. Over the time Fort Nisqually functioned as a trading post, about 5,000 beaver, 3,000 muskrat, 2,000 raccoon and 1,500 river otter furs were collected. Founded in 1840, the Pugets Sound Agricultural Company (PSAC) was formed as a subsidiary of the HBC to meet its contractual obligations with the Russian-American Company in the RAC-HBC Agreement. Fort Nisqually and Cowlitz Farm were attached to the new venture, though it remained staffed and managed by HBC personnel. In 1841 mostly Métis families from the Red River colony were hired by the PSAC to become pastoralists and farmers upon its two stations. After traveling overland to Fort Vancouver by James Sinclair, 14 Métis emigrant families from the Red River colony chose Fort Nisqually as their final destination. The station was removed in 1843 to be closer to Edmonds Marsh and Sequalitchew Creek, putting it in proximity of a water source and timber. Fort Nisqually started to export livestock and crops for local consumption and export to principally to Russian Alaska, the Kingdom of Hawaii, and Alta California. The herds of cattle, originally from Mexico, numbered over 2,000 in 1845 and supplied many of the HBC forts in the region. The sheep herds maintained were "aristocrats of the wool breeds", being composed of mixtures of Chevoit, Leicester and Southdown breeds. The flocks numbered almost 6,000 in 1845, doubled in size by 1849 but began a decrease of numbers until by 1856 the station had a little over 5,000. Tolmie was the manager of the PSAC from 1843 to 1857, overseeing the pastoral and agricultural projects from Fort Nisqually. His tenure covered the transition from British to American control beginning in 1846 as result of the Oregon Treaty, and the Puget Sound War. He was well respected because of his experience with the region and maintained friendly relations with the British, Indigenous peoples and American settlers. ...an enclosure of fir logs, on an average eighteen feet high, enclosing a space one hundred fifty feet on each side and having a small unarmed bastion at the four corners. Inside is a house for the superintendent, a store for trading in furs and several small buildings for the lodging of servitors and voyageurs. The 1846 treaty between the United States and Great Britain established the border between British North America and the United States at the 49th parallel, which left Fort Nisqually on American soil. Early American settlers on the Puget Sound began arriving in numbers during the 1850s to claim land authorized by the Donation Land Claim Act. This group was dependent upon Fort Nisqually for provisions and supplies, unable to make the needed food themselves. Bartering was the norm, with agricultural produce accepted as payment. Squatters from the United States became a problem for Fort Nisqually. Twenty-eight separate attempts to take portions of the fort's land happened in 1851, jumping to 50 incidents two years later. The herds of Fort Nisqually became targeted as well, an officer reporting in 1854 that "two or three bands of Americans [are] constantly about the plains killing our beef..." With the fur trade in decline and increasing harassment from American settlers, tax collectors, and revenue agents, Fort Nisqually closed in 1869. A former employee of Fort Nisqually, Mr. Huggins, became an American citizen and took over the site as his homestead. The restored Fort Nisqually blockhouse at Point Defiance Park. In the 1930s, Fort Nisqually was rebuilt in its current location in Point Defiance Park in Tacoma, Washington. The restoration was part of President Franklin Roosevelt's New Deal program to provide jobs to the Great Depression stricken nation. The effort was funded and backed by the WPA and the Tacoma Businessmen's Association. Only two buildings, the granary and factor's house, were moved from their original locations, the rest having fallen into decay. The Fort Nisqually Granary was declared a National Historic Landmark in 1970. Today, the restored Fort Nisqually is a living history museum run by employees and volunteers. Two of the original buildings, the Factor's House, and the Granary remain. In addition, there is a trade store, working blacksmith shop, laborers dwelling house, demonstration kitchen, and kitchen garden. Fort Nisqually has seen recent changes designed to capture its original character. These changes include, most significantly, the restoration of the Factor's House, and the relocation and restoration of the two 1830s era bastions. In addition a section of the palisades wall is designed to replicate the 1847 era wall. Archeology was conducted in 1988–89 to determine the placement, orientation and size of the northeast bastion and palisades wall. Hundreds of artifacts were discovered and catalogued and have added to the historical record. In addition, much research has been conducted using the original journals as well as hundreds of letters of Edward Huggins. Huggins was a clerk of the HBC who arrived in 1850. Huggins, originally a Londoner, eventually became an American citizen and homesteaded the land and buildings after it was abandoned by the HBC. He lived on the land until 1906 when he died of colon cancer. The restored fort is managed by Metro Parks Tacoma. The 1833 location is located on The Home Course golf course in DuPont. The 1843 location in DuPont, where the buildings now at Point Defiance were originally located, is owned by The Archaeological Conservancy, is managed by DuPont Historical Society, and is closed to the public, except when opened as part of the Fort Nisqually celebration held each year. Logs mark the location of the original walls, but there are no buildings remaining. The only visible remnants of the original fort are a line of black locust trees, planted in the 1850s. DuPont's History Museum has information on the site plans and a collection of other items from the Hudson's Bay Company. ^ a b "Fort Nisqually Granary". National Historic Landmark summary listing. National Park Service. Retrieved 2008-06-26. ^ Hunt & Kaylor 1917, p. 29. ^ a b Bagley 1915. ^ a b c d e f g h Galbraith 1950. ^ Gibson 1985, p. 60. ^ Watson 2010, p. 1073. Hunt, Herbert; Kaylor, Floyd C. (1917), Washington, West of the Cascades: Historical and Descriptive; the Explorers, the Indians, the Pioneers, the Modern, 1, Seattle: S. J. Clarke Publishing Co.
Wikimedia Commons has media related to Fort Nisqually.